Hello, friends! 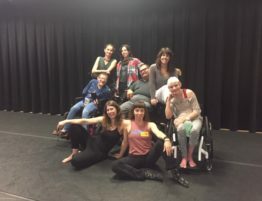 This is Olivia, project coordinator for Body Shift, VSA Texas’ and Forklift Danceworks’ acclaimed mixed-ability dance project. 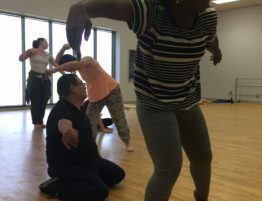 Every 2nd and 4th Saturday of the month Body Shift offers a class we call Elements in which we practice improvisational dance in an inclusive way by using the DanceAbility method. You can find a general overview of what to expect from Elements in my blog post from April 28, 2016 here. 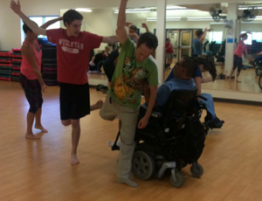 In DanceAbility, we work with four basic principles that are the building blocks of choreography. These include sensation, relationship, time and design. Oftentimes we will choose one of these principles to narrow the focus in order to increase the students’ understanding and awareness of how to make use of these elements. In class last Saturday, after working to develop our awareness of moving from internal sensation and how to be in relationship to a partner, I led the group through an exploration of time. Time is relative to the person and the pace that is reasonable for their body. 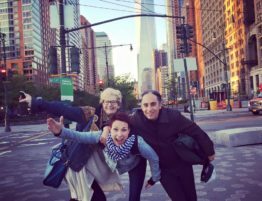 You can do a quick improv wherever you are as you read this… Choose one body part and begin moving it in whatever way feels good to you. Notice the sensation that is generated from that movement. Continue with the same basic moves but now try doing them fast (whatever fast means to you). Then try doing them slow (whatever slow means to you). Try going back and forth between fast and slow while moving a different body part or your whole body and add in the option to be still whenever you choose. As you are moving, continue to see if you can stay aware of what it feels like as you move. Staying in tune with sensation when moving fast is a more advanced skill and takes practice. Continue moving fast, slow and being still and now add in the awareness of duration. How long do you choose to move fast? Slow? Be still? Notice if you fall into a pattern of doing the same speed for the same length of time and challenge yourself to mix things up – sometimes longer stillness; sometimes moving short and quick or long and sustained, etc. After practicing with time as a solo, you can also work with a partner or in groups. 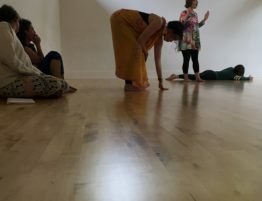 Last Saturday we went from working with fast, slow and stillness in duets to quartets to the whole group into an open improvisation at the end of class. Below are two short clips from our exploration in pairs. Notice the diverse range of choices people are making about what fast, slow, and still means. Also notice how long they choose to stay with each as well as the way they are affected by their partner. Sometimes one might choose to follow their partner’s pacing or they may choose to contrast. Hope to see you in class August 13th! 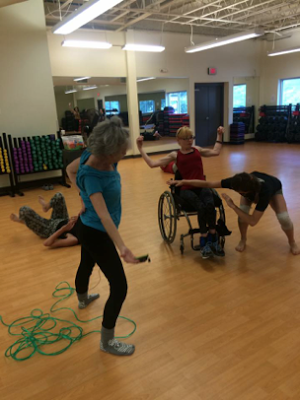 Elements takes place every 2nd and 4th Saturday of the month at the Townlake YMCA in Austin from 2:30-4:30pm. 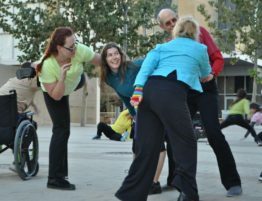 Like Body Shift on Facebook and visit our website for more details: www.bodyshift.org.